The music ranges from rhythmic romps to simple melodies. Very listenable to general audiences but also of interest to Twentieth Century enthusiasts. Tasteful playing and very interesting textures ranging from the eclectic bizarre to simple solo guitar as in the third movement. By the way, there is something about guitar and clarinet that I really like…can’t put my finger on it but it just hits the spot, especially when the strings are in accompaniment. The other works on the album include Sonata Concertata, Op. 61 for guitar & violin by Niccolo Paganini and Histoire du Tango for guitar & violin by Astor Piazzolla. The Piazzolla with Joy Wiener was recorded live and has a great quality to the improvisatory nature of the work. Wiener’s sound has the execution of a classical player but some of the nuances of a jazz performance in this work. Really exciting and great for listening to for enjoyment not just reference. I really liked these tracks because it sounds as though the performers were having some real fun. I’ve heard this work recorded in a dry and ‘classical’ way but this performance was much more raunchy and seductive. Nice work. The Paganini is fun and virtuosic and adds a some lighter playing if the Uspensky is not your thing. I’m not particularly interested in Paganini but the performance was good with plenty of risk and some blazing lines from Afshar. The performances are excellent. Afshar has great musical shaping and knows when to be accompaniment and when to highlight the guitar. There are some very virtuosic moments and Afshar handles them with ease and style. The recording quality is pleasing to the ear but does sound a bit like listening to a old record player. It’s not crystal clear but is actually still a very nice sound. It was not what I expected from a modern release but I’m not complaining. The guitar is a bit dry (as in not much reverb) but that works well in the context of this larger ensemble. I listened to album up close while reviewing but also while cooking dinner (a true test?) and enjoyed both experiences. The Piazzolla is a treat for its jazzy Argentinian vibe. But the real reason you should pick up a copy of this album is for the work by Vladislav Uspensky. It’s a great chamber work and should be explored by all. I think we’ll be seeing this work programmed regularly once people start hearing it as it will be enjoyed by audiences and musicians alike. The recording quality could have been better but it actually had a nice listening quality to it. A great album with spectacular playing all around plus an important world premiere recording of Uspensky. 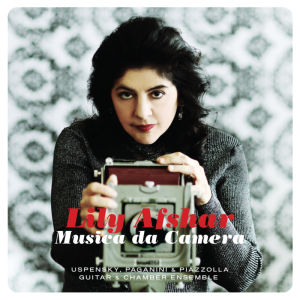 I really enjoyed your insightful review of Lily Afshar’s “Musica da Camera”. I agree with you that her premiere recording of Uspensky’s “Musical Sketches on Pushkin’s Eugene Onegin” will be an important contribution to the guitar repertoire. In the recording and mixing of “Musica da Camera” we used an API analog mixing desk. It was not mixed “inside the computer” as most records are these days. On this particular record we even utilized analog tape in the mixing process. Analog tape often adds a small amount of audible noise to a recording but the “musicality” of analog tape more than makes up for it, in my opinion. This may be what you are hearing and also why it has a “nice listening quality to it”. 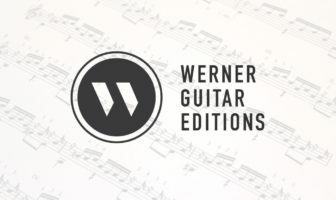 As for the guitar being “a bit dry”, I think that’s just my (our) preference- having heard so many classical guitar recordings with too much reverb. Thank you for listening as carefully as you did and for writing about “Musica da Camera”. Thanks so much for commenting. The sound has some real character which is the best part about it, most modern recordings are a bit harsh and metallic but this one had a sweetness to it that did the job!